British dramatist, son of William Farquhar, a clergyman, born in Londonderry, Ireland, in 1677. When he was seventeen he was entered as a sizar at Trinity College, Dublin, under the patronage of Dr. Wiseman, bishop of Dromore. He did not long continue his studies, being, according to one account, expelled for a profane joke. Thomas Wilkes, however, states that the abrupt termination of his studies was due to the death of his patron. He became an actor on the Dublin stage, but in a fencing scene in John Dryden's Indian Emperor he forgot to exchange his sword for a foil, with results which narrowly escaped being fatal to a fellow actor. After this accident he never appeared on the boards. He had met Robert Wilks, the famous comedian, in Dublin. Though he did not, as generally stated, go to London with Wilks, it was at his suggestion that he wrote his first play, Love and a Bottle, which was performed at Drury Lane, perhaps through Wilks's interest, in 1698. He received from the earl of Orrery a lieutenancy in his regiment, then in Ireland, but in two letters of his dated from Holland in 1700 he says nothing of military service. His second comedy, The Constant Couple: or a Trip to the Jubilee (1699), ridiculing the preparations for the pilgrimage to Rome in the Jubilee year, met with an enthusiastic reception. Wilks as Sir Harry Wildair contributed substantially to its success. In 1701 Farquhar wrote a sequel, Sir Harry Wildair. Leigh Hunt says that Anne Oldfield, like Wilks, played admirably well in it, but the original Lady Lurewell was Mrs. Verbruggen. Mrs. Oldfield is said to have been the "Penelope" of Farquhar's letters. In 1702 Farquhar published a slight volume of miscellanies -- Love and Business; in a Collection of Occasionary Verse and Epistolary Prose -- containing, among other things, "A Discourse on Comedy in reference to the English Stage", in which he defends the English neglect of the dramatic unities. "The rules of English comedy", he says, "don't lie in the compass of Aristotle or his followers, but in the pit, box and galleries." In 1702 he borrowed from Fletcher's Wild Goose Chase, The Inconstant, or the Way to win Him, in which he followed his original fairly closely except in the last act. In 1703 he married, in the expectation of a fortune, but found too late that he was deceived. It is said that he never reproached his wife, although the marriage increased his liabilities and the rest of his life was a constant struggle against poverty. His other plays are: The Stage Coach (1704), a one-act farce adapted from the French of Jean de la Chapelle in conjunction with Peter Motteux; The Twin Rivals (Drury Lane, 1702); The Recruiting Officer (Drury Lane, 1706); and The Beaux' Stratagem (Haymarket, 1707). The Recruiting Officer was suggested to him by a recruiting expedition (1705) in Shropshire, and is dedicated to his "friends round the Wrekin." The Beaux' Stratagem is the best of all his plays, and long kept the stage. Genest notes nineteen revivals up to 1828. Two embarrassed gentlemen travel in the country disguised as master and servant in the hope of mending their fortune. The play gives vivid pictures of the Lichfield inn with its rascally landlord, and of the domestic affairs of the Sullens. Archer, the supposed valet, whose adventurous spirit secures full play, was one of David Garrick's best parts. Meanwhile one of his patrons, said to have been the Duke of Ormond, had advised Farquhar to sell out of his regiment, and had promised to give him a captaincy in his own. Farquhar sold his commission, but the duke's promise remained unfulfilled. Before he had finished the second act of The Beaux' Stratagem he knew that he was stricken with a mortal illness, but it was necessary to persevere and to be "consumedly lively to the end." He had received in advance �30 for the copyright from Bernard Lintot the bookseller. 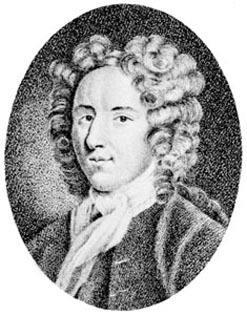 The play was staged on the 8th of March, and Farquhar lived to have his third night, and there was an extra benefit on the 29th of April, the day of his death. He left his two children to the care of his friend Wilks. Wilks obtained a benefit at the theater for the dramatist's widow, but he seems to have done little for the daughters. They were apprenticed to a mantua-maker, and one of them was, as late as 1764, in receipt of a pension of �20 solicited for her by Edmund Chaloner, a patron of Farquhar. She was then described as a maidservant and possessed of sentiments "fitted to her humble situation." The plots of Farquhar's comedies are ingenious in conception and skilfully conducted. He has no pretensions to the brilliance of William Congreve, but his amusing dialogue arises naturally out of the situation, and its wit is never strained. Sergeant Kite in the Recruiting Officer, Scrub, Archer and Boniface in The Beaux' Stratagem are distinct, original characters which had a great success on the boards, and the unexpected incidents and adventures in which they are mixed up are represented in an irresistibly comic manner by a man who thoroughly understood the resources of the stage. The spontaneity and verve with which his adventurous heroes are drawn have suggested that in his favorite type he was describing himself. His own disposition seems to have been most lovable, and he was apparently a much gayer person than the reader might be led to suppose from the "Portrait of Himself" quoted by Leigh Hunt. The code of morals followed by these characters is open to criticism, but they are human and genial in their roguery, and compare far from unfavorably with the cynical creations of contemporary drama. The advance which he made on his immediate predecessors in dramatic construction and in geheral moral tone is more striking when it is remembered that he died before he was thirty.